"Humanity Star is a way of looking beyond our immediate situation, whatever that may be, and understanding we are all in this together as one species, responsible collectively for innovating and solving the challenges facing us all," he said. “Still Testing," the second flight of Rocket Lab's Electron carbon-composite launch vehicle, lifted off from Māhia Peninsula in New Zealand with "The Humanity Star" on Jan. 20, 2018. The Humanity Star was deployed into orbit 8 minutes and 31 seconds after leaving the Earth. Now circling the planet every 90 minutes, the satellite was designed to serve as a "bright symbol about our fragile place in the universe." "We need to make big decisions in the context of humanity as a whole, not in the context of individuals, organizations or even nations," stated Beck, whose idea it was to launch The Humanity Star satellite. "We must come together as a species to solve the really big issues like climate change and resource shortages." Though unique in its symbolic purpose, The Humanity Star is not the first "disco ball" launched into Earth orbit. 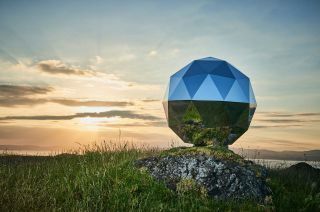 The Starshine project comprised three spherical satellites fitted by the United States Naval Research Laboratory with small mirrors polished by students from around the world. The Starshine-1 and -2 satellites were launched on NASA space shuttle missions STS-96 in June 1999 and STS-108 in December 2001, respectively. The 19-inch diameter (48 cm) spheres were each covered in more than 850 mirrors. Rocket Lab founder and CEO Peter Beck stands with his creation, "The Humanity Star," now shining from Earth orbit. Starshine-3, which was almost twice the size of the earlier satellites and fitted with 1500 polished mirrors, was lofted into orbit on an Athena I uncrewed rocket from the Kodiak Launch Complex in Alaska in September 2001. It reflected light back at the Earth for two years, completing more than 7,400 revolutions. Japan also launched a mirror-covered satellite, "Ajisai," in August 1986, on board the maiden launch of its H-I rocket. The 85-inch (215 cm) experimental geodetic satellite is still in orbit and can be seen with binoculars. The Humanity Star is expected to be visible for about nine months before its orbit begins to decay and it is destroyed re-entering the atmosphere. Rocket Lab has established a website to track the satellite in real time.